Its been a few weeks since I wrote the first post to this series. If you missed it you could always go back and visit here! This week I want to dive deeper into the what we call The First Look. The subject of this non-traditional approach to the wedding day timeline often gets mixed feelings from both the bride and groom. We know that tradition sometimes plays a big role in your wedding day and although we as your storytellers completely respect that we want to share a flip side to that old tradition. Today I want to highlight some of the reasons why we love when our couples choose a first look and why seeing one another before the ceremony actually helps relieve some of the stress of the day! A Quiet Moment: With the hustle and bustle of the wedding day, we hear over and over from brides alike that the day flies by. From the moment they start getting ready to the grand exit, there is little to no time to breath. This can make the day exhausting and everything about it a blur. Choosing to do a First Look requires the couple to stand back and pause. To take in one another and the weight of the importance of the day. There is no crowd of people around and no voices but their own. It is a quiet moment. Just the two of them. Emotions: One thing that is very important to the bride is capturing the grooms first reaction when she walks down the aisle. As a girl, I totally get this. What girl wouldn’t want to see an overwhelming face full of joyful tears awaiting her at the front. In her mind it is Pinterest perfect. The problem with our Pinterest perfect ideas is that every guy is different. Not every man is comfortable with showing emotion in front of hundreds of guests. So the reaction that the bride is hoping for is not there. Not because he has no reaction, but because he shows his emotions differently. Choosing to do the first look gives the groom an opportunity to take in his beautiful bride during an intimate moment with just the two of them. He can also embrace his beautiful bride and hold her while they take in the emotion of the day. Picture Opportunities: I am not going to lie. Those couples that decide to do a First Look usually have quite a few more pictures than those who opt out. The reason being is because not only are we doing pictures during the scheduled portrait time but we are also grabbing a few more bride & groom pictures during the First Look. With a First Look you are getting at least 2 different scenic options as well. Timeline: When a couple chooses to see one another before the ceremony, this is a huge help when it comes to timeline. If there is enough time before the ceremony we are able to not only do the First Look, but also possibly some bridal party pictures and family pictures. This means after the ceremony the couple has more time to enjoy the party! I also invited all our Instagram friends to share why or why not they did a First Look! 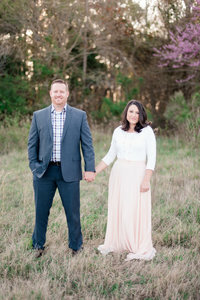 I love what our sweet friend Courtney from Courtney Inghram Events said! –We did a first look and I am SO happy we did. I was an absolute bundle of nerves that day, and when I saw my sweet husband I literally burst into tears and happy sobbed for a solid five minutes. If I had cried for that long during our wedding ceremony in front of all of our guests, I think I would have felt a little embarrassed; but with just him there it was intimate and sweet! I wasn’t going to do a first look until after my photographer highly recommended it, and now looking back, I’m glad we decided to do it! In the five years that we have been shooting we have never had a couple regret doing the first look. It has always been just the opposite. We do know that every couple and every wedding is different. And although we will always recommend a First Look, we know that there are couples who wish to do things more traditional. For those couples then my next blog post is for you. Another option to the First Look and how to still make time for the portraits you love.